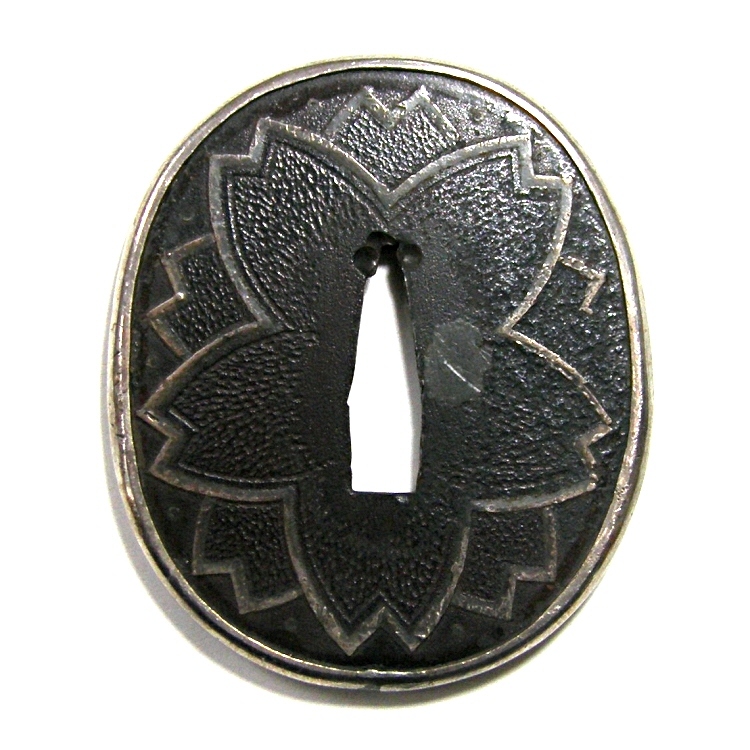 Japanese Antique Sword Guards for Sale ! Please divide each number by 2.54 if you would like to transform centimeters into inches. And please multiply 0.0353 if you would like to transform grams into ounces. 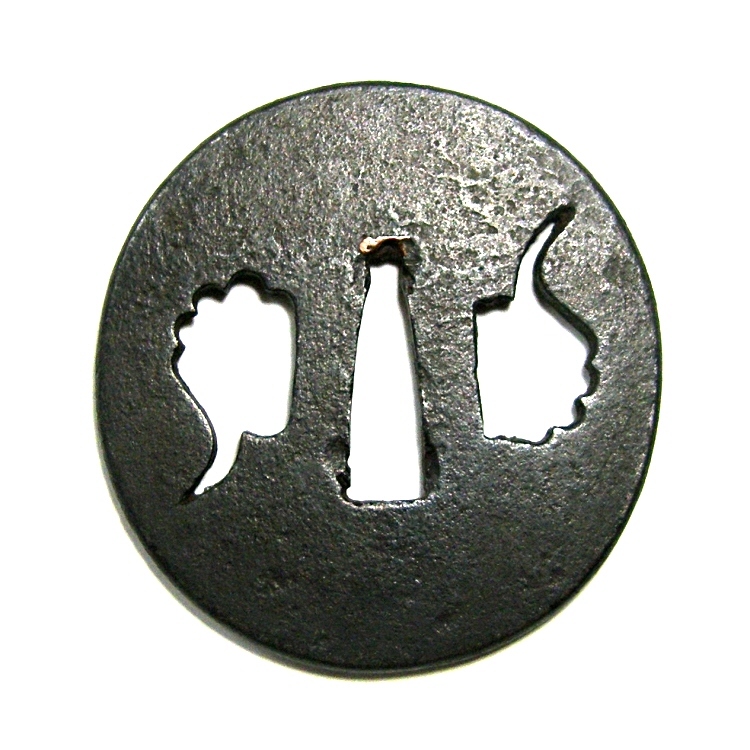 SummaryThis tsuba is categorized as "Owari Sukashi Tsuba" by NBTHK Certificate. The color is nice and the condition is good. 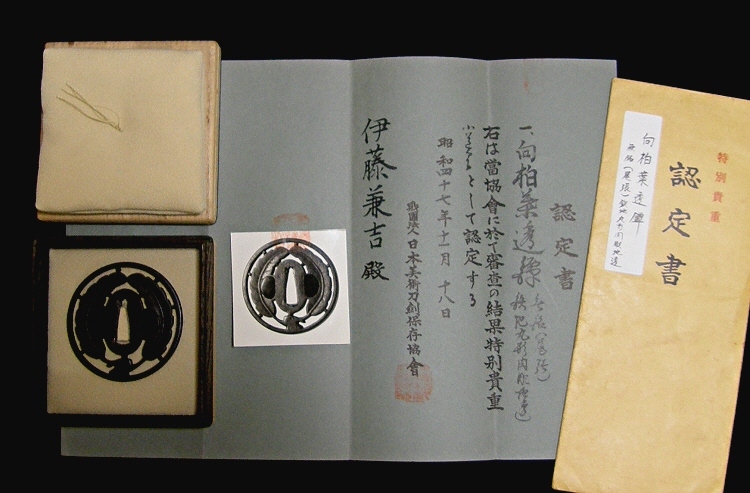 Certificate issued by NBTHK proves that this tsuba was made by Koike Yoshiro, the founder of the Yoshiro-Shiki Shinchu-Zogan Style Tsuba. 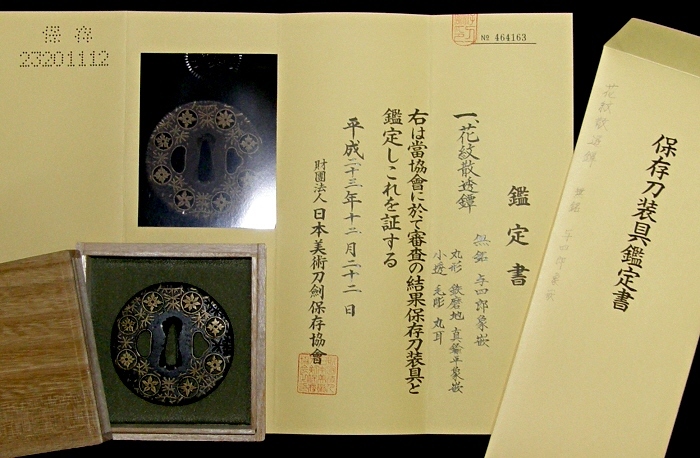 SummaryCertificate issued by NBTHK proves that this tsuba was made by Koike Yoshiro, the founder of the Yoshiro-Shiki Shinchu-Zogan Style Tsuba. This sword guard was made by a craftsman of the Nara school in Edo. SummaryKozuka made by Ko-Kinko (Craftsman before the Momoyama period). With NBTHK Certificate and also endorsement of Sato Kanzan ! 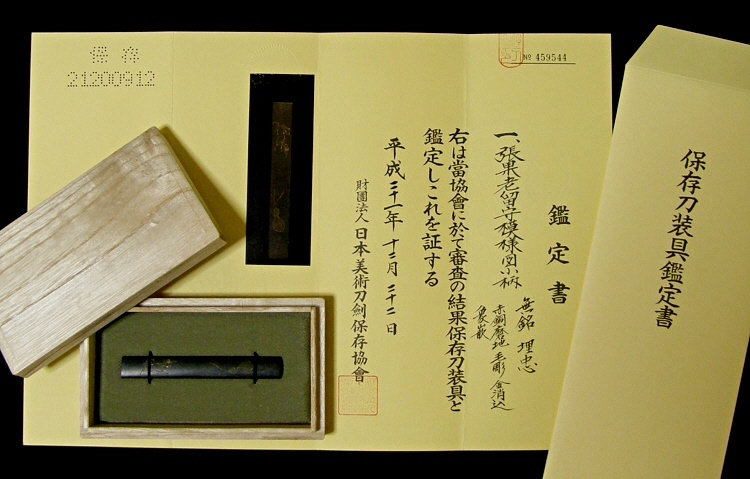 SummaryThis Shakudo Kozuka was made by the giant, Umetada Myoju or his close disciple. SummaryFuchi & Kashira set made by Nara Masanaga, very well-known craftsman of the Nara School. With NBTHK Kanteisho. SummaryIts circumference is covered with silver plate. Sakura flowers are expressed in silver inlay. SummaryThis sword guard is for a Wakizashi. Amida-Yasuri pattern is expressed in engraving. 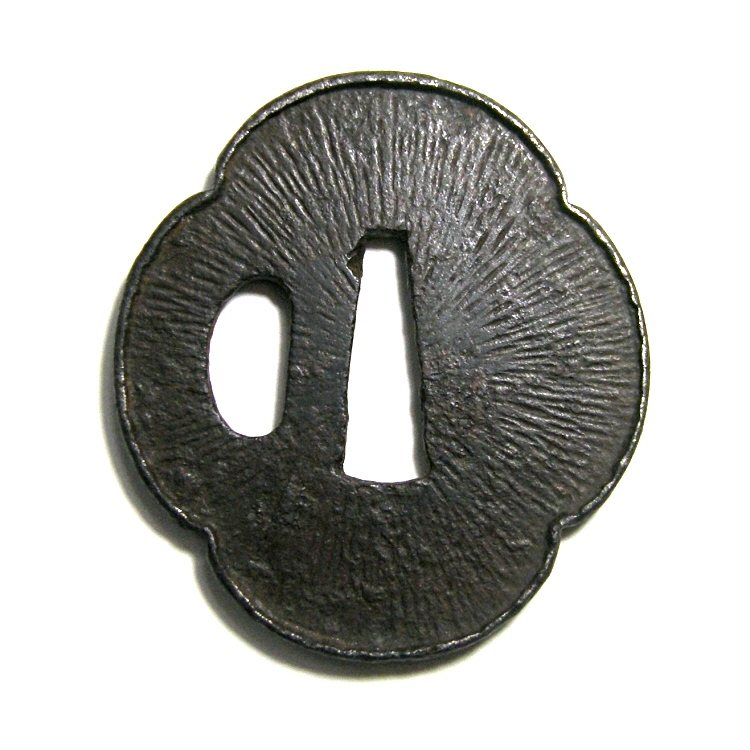 SummaryAntique sword guard shaped like sea cucumber (Namako-Sukashi). It is patterned in arabesque. SummaryThe motif is "Inome" (Boar's eye). The color is nice as the iron plate is tempered very well. SummaryFuchi & Kashira Set made by Hamano school in Edo. 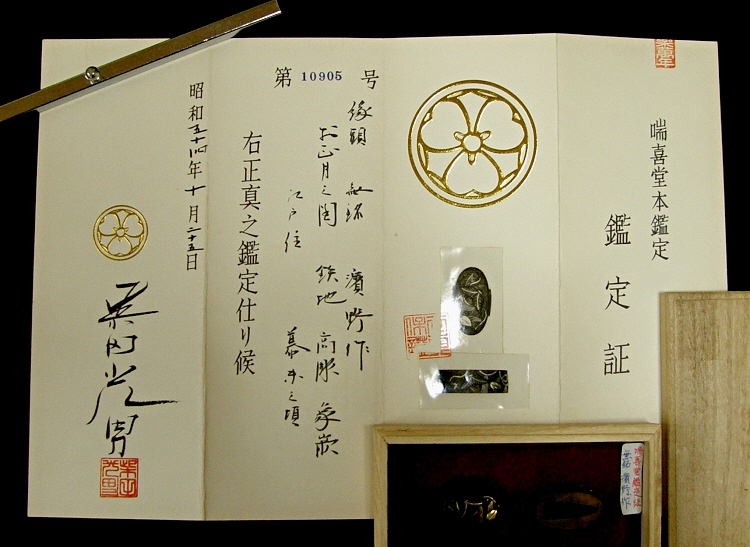 A Kanteisho certificate issued by Mitsuo Shibata, famous Japanese sword appraiser is attached. 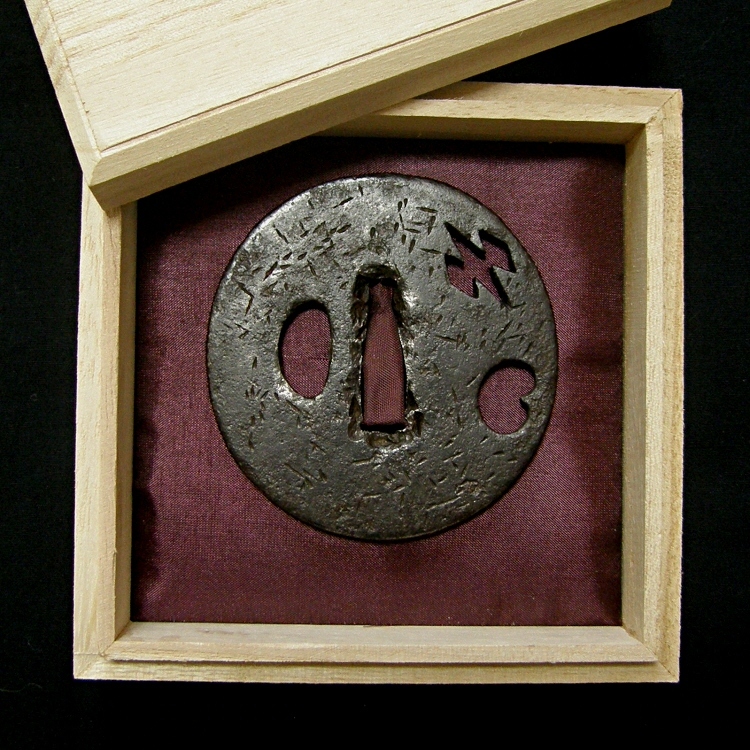 SummaryThis tsuba must be categorized as the "Tosho-Tsuba". This Menuki set is made by Kyo-Kinko. 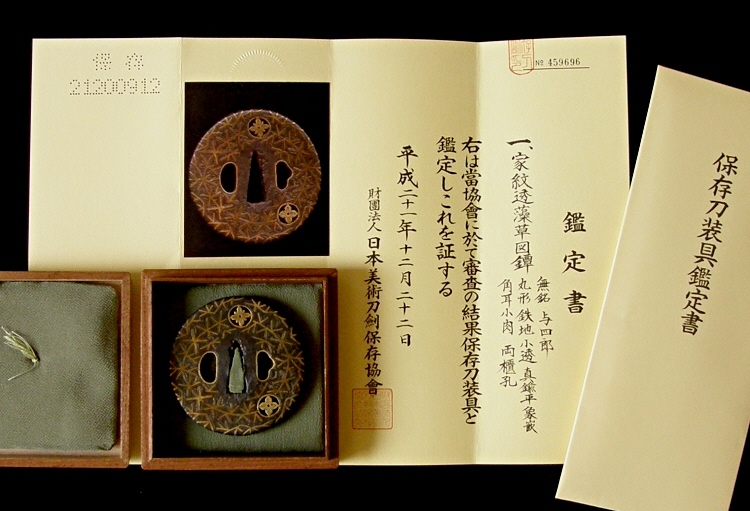 The pair of Menuki is shaped in the Katachibori and is inlaid with gold. SummaryTsuba made from well forged iron. The motif is a hatchet. It is expressed in small openwork. SummaryA pair of Menuki made of Shakudo. The motifs (dragons) are expressed in the Katachibori and Iroe inlay with gold. SummaryDescription This tsuba is for a short sword. 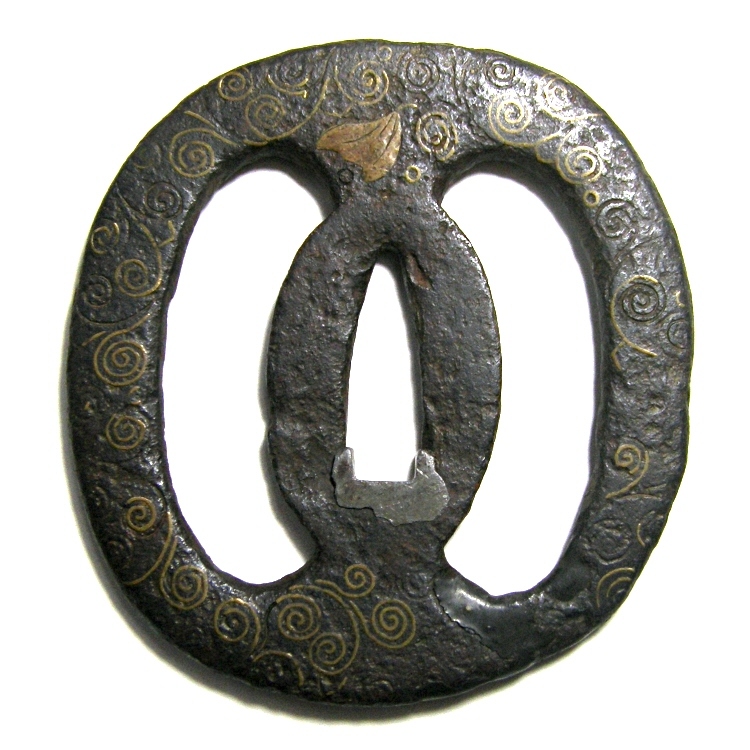 SummaryThere is an inscription "Nobuie" on this tsuba. 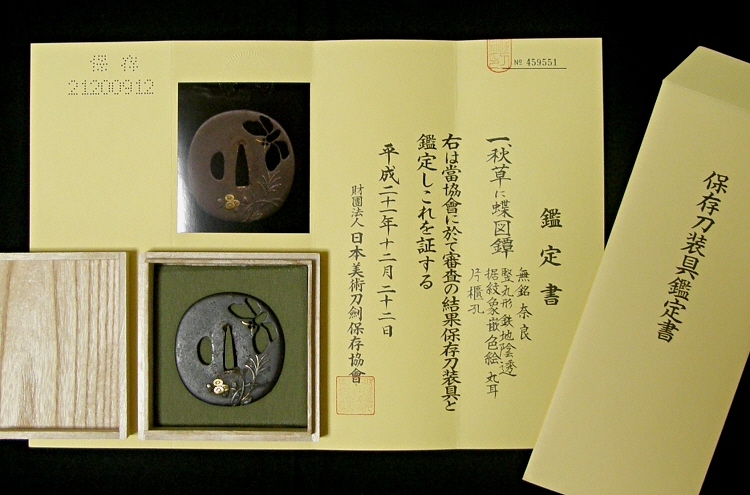 Very famous and important tsuba craftsman. SummaryIron plate is very well forged. So, the color of this tsuba is very tasteful. Very exquisite sword guard. SummaryThe color of this tsuba is nice as it is forged very well. SummaryVery beautiful tsuba. Kiku flowers are expressed in brass inlay and high relief carving on Shakudo Nonako-Ji. 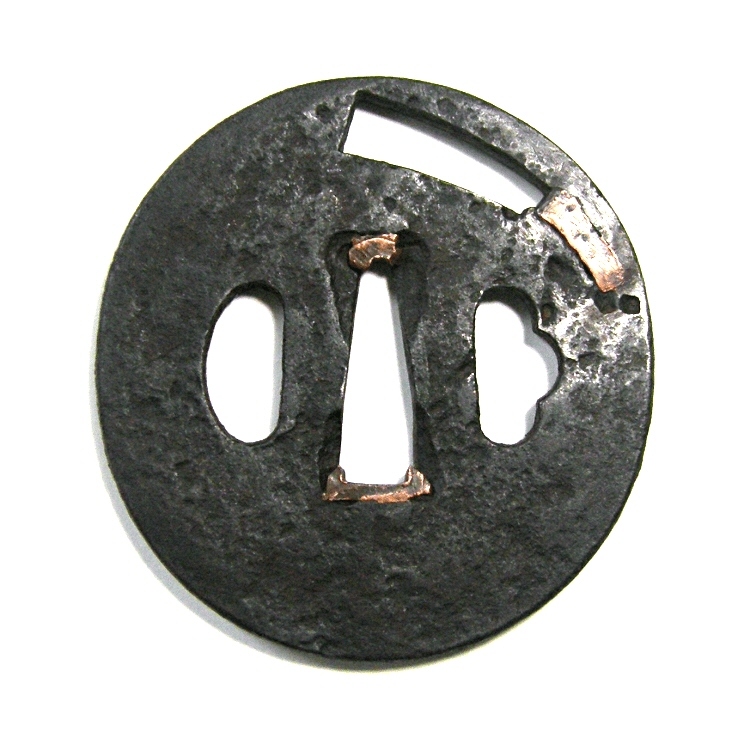 Title[ Millet ] Inscribed " Shoami "
SummaryWell-forged iron plate tsuba made by a Shoami school craftsman. 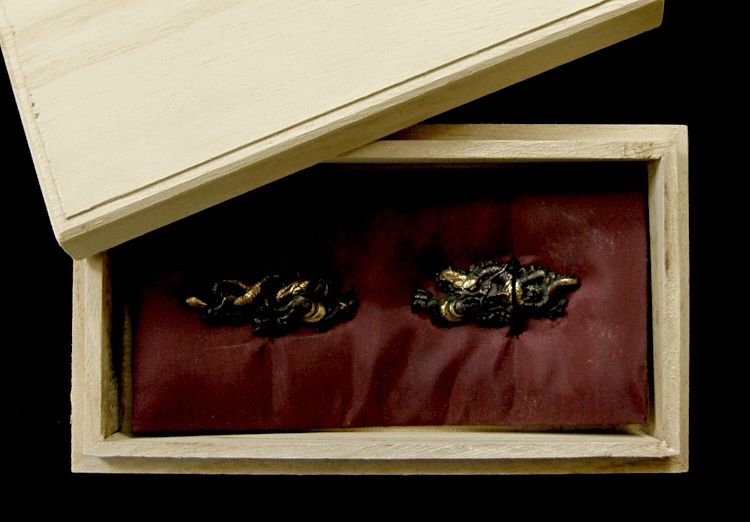 Foxtail grass is expressed in carving and the Zogan inlay with gold. 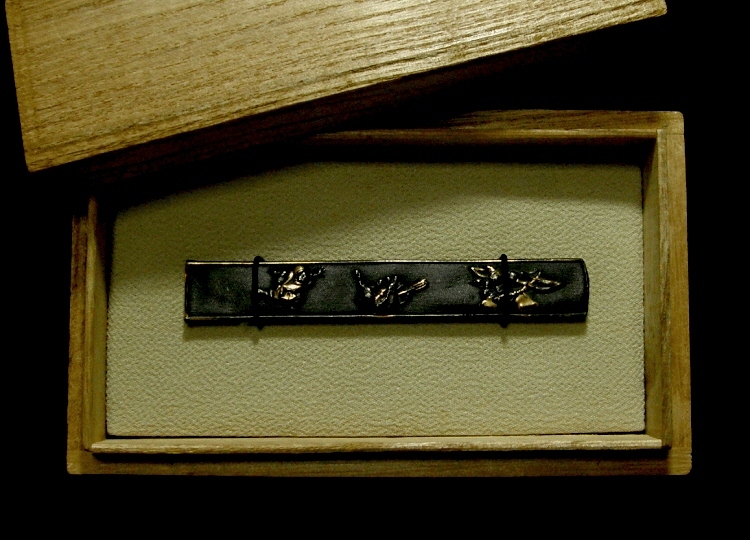 SummaryShakudo Nanako-ji Gold Inlaid Kozuka. The Kozuka looks gorgeous !